156:1.1 There lived near the home of Karuska, where the Master lodged, a Syrian woman who had heard much of Jesus as a great healer and teacher, and on this Sabbath afternoon she came over, bringing her little daughter. The child, about twelve years old, was afflicted with a grievous nervous disorder characterized by convulsions and other distressing manifestations. 156:1.2 Jesus had charged his associates to tell no one of his presence at the home of Karuska, explaining that he desired to have a rest. While they had obeyed their Master's instructions, the servant of Karuska had gone over to the house of this Syrian woman, Norana, to inform her that Jesus lodged at the home of her mistress and had urged this anxious mother to bring her afflicted daughter for healing. This mother, of course, believed that her child was possessed by a demon, an unclean spirit. 156:1.3 When Norana arrived with her daughter, the Alpheus twins explained through an interpreter that the Master was resting and could not be disturbed; whereupon Norana replied that she and the child would remain right there until the Master had finished his rest. Peter also endeavored to reason with her and to persuade her to go home. He explained that Jesus was weary with much teaching and healing, and that he had come to Phoenicia for a period of quiet and rest. But it was futile; Norana would not leave. To Peter's entreaties she replied only: "I will not depart until I have seen your Master. I know he can cast the demon out of my child, and I will not go until the healer has looked upon my daughter." 156:1.4 Then Thomas sought to send the woman away but met only with failure. To him she said: "I have faith that your Master can cast out this demon which torments my child. I have heard of his mighty works in Galilee, and I believe in him. What has happened to you, his disciples, that you would send away those who come seeking your Master's help?" And when she had thus spoken, Thomas withdrew. 156:1.5 Then came forward Simon Zelotes to remonstrate with Norana. Said Simon: "Woman, you are a Greek -speaking gentile. It is not right that you should expect the Master to take the bread intended for the children of the favored household and cast it to the dogs." But Norana refused to take offense at Simon's thrust. She replied only: "Yes, teacher, I understand your words. I am only a dog in the eyes of the Jews, but as concerns your Master, I am a believing dog. I am determined that he shall see my daughter, for I am persuaded that, if he shall but look upon her, he will heal her. And even you, my good man, would not dare to deprive the dogs of the privilege of obtaining the crumbs which chance to fall from the children's table." 156:1.6 At just this time the little girl was seized with a violent convulsion before them all, and the mother cried out: "There, you can see that my child is possessed by an evil spirit. If our need does not impress you, it would appeal to your Master, who I have been told loves all men and dares even to heal the gentiles when they believe. You are not worthy to be his disciples. I will not go until my child has been cured." 156:1.7 Jesus, who had heard all of this conversation through an open window, now came outside, much to their surprise, and said: "O woman, great is your faith, so great that I cannot withhold that which you desire; go your way in peace. Your daughter already has been made whole." And the little girl was well from that hour. 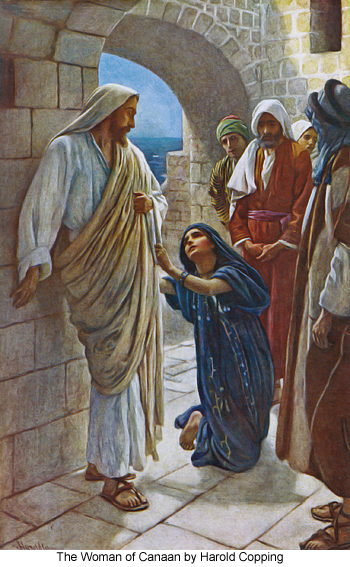 As Norana and the child took leave, Jesus entreated them to tell no one of this occurrence; and while his associates did comply with this request, the mother and the child ceased not to proclaim the fact of the little girl's healing throughout all the countryside and even in Sidon, so much so that Jesus found it advisable to change his lodgings within a few days. 156:1.8 The next day, as Jesus taught his apostles, commenting on the cure of the daughter of the Syrian woman, he said: "And so it has been all the way along; you see for yourselves how the gentiles are able to exercise saving faith in the teachings of the gospel of the kingdom of heaven. Verily, verily, I tell you that the Father's kingdom shall be taken by the gentiles if the children of Abraham are not minded to show faith enough to enter therein." Mark 7:24 And from there he arose and went away to the region of Tyre and Sidon. And he entered a house, and would not have any one know it; yet he could not be hid. But immediately a woman, whose little daughter was possessed by an unclean spirit, heard of him, and came and fell down at his feet. Now the woman was a Greek, a Syrophoeni'cian by birth. And he said to her, "For this saying you may go your way; the demon has left your daughter." And she went home, and found the child lying in bed, and the demon gone.